We've been binge-watching Doc Martin on Netflix, so I've been able to get quite a bit done on the Grandmother's Flower Garden quilt. I mentioned previously that I hoped to make each one unique, but already I've broken away from that. I kitted up many of the blocks, and failed to catch this copy. For some reason, I have quite a few of the orange centers, but will have to break away from that. A couple of purple centers. My quality control inspector seems to be happy with the work in process so far. See the black furry cat behind the pillow? He is sleeping in front of the window. Mr. California Stitching left this morning for New Haven, to help our son move to Seattle for a new job, and the little ones have decamped for California with their parents. So I should be able to get quite a bit done in the few days before Christmas. Here in the US, the Saturday after Thanksgiving is beginning to be known as "Small Business Saturday", a way to get consumers to shop at small, local, brick and mortar businesses. So I decided that I really needed to visit the local quilt shops in nearby Ft Collins. Well, one especially diabolical shop was giving away laser cut hexagons, seven for walking in the door and an additional seven for each yard of fabric purchased. I ended up with four sets of seven hexies. Then I went to another shop, where another customer walked off with my Christmas fabric for stockings that I need to make (since mine are all in storage). By the time I got the fabric back (only an hour later) I was given a fat quarter bundle for my inconvenience. I picked one that coordinated with the hexies I got earlier. So now, I absolutely have to make a Grandmother's Flower Garden quilt. The centers will all be bright fabrics, purple, pink, orange, green and blue. I'm not paper piecing these, as I am starching the fabric really well, then cutting with a special hexie cutting ruler. I mark the seam intersections (with a template made from cardboard), then just hand sew away. I have these three finished so far. I plan on making them into a twin quilt for a daybed I'll be buying for the new house. These are my "connecting fabrics", some pink, apricot, yellow and a smidge of very light green. The yardage on the left will probably be the hexies for the border. I have absolutely no idea of how I will finish this, but will see how it goes. 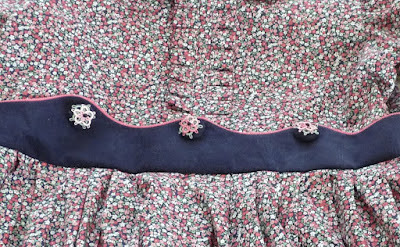 I'm trying to make each flower unique, so am bundling sets together without duplicating fabrics. One thing I'm finding is that some of these batiks are hard to sew through, probably due to all the dye in the fabric. Hand quilting is definitely not an option. I had a bit of help with the photo shoot, but my little helper got bored and decided a nap was a better use of his time (my mother made that little afghan for my children). I'll post photos as I complete a few of the flowers. This will enable me to sew while watching TV, as I can't seem to tat or embroider very well in front of the tube. I make too many mistakes. 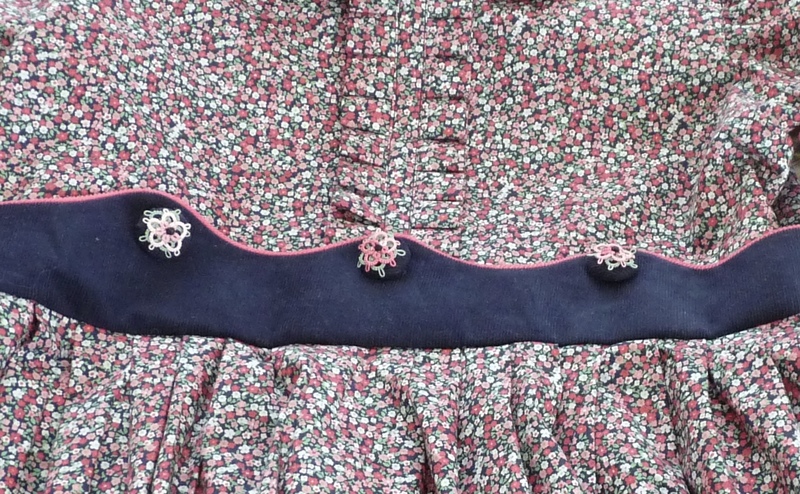 With the hexies, a mistake is very easy to remedy, just two inches of hand sewing to take out. Some of you have expressed interest in knowing how the new house is coming along, and I had idly thought of starting a new blog just for my new home construction. But I thought better of it, as I worried about maintaining two blogs when I have enough to do with just the one. Instead, I'll have a series of posts describing the building and all we went through to get to this stage. Just click on the label "New Home" in the cloud to see all the posts (but not now, this is the first post). Here is the house a few days ago, and already it looks different! The windows are in and some of the shingles on the gables are being installed. On the left, behind the Port - a - Potty, there is a baby park, which is nice. So far the lot in back of us hasn't been sold. The neighborhood is about 80% built, which means there shouldn't be a lot of construction going on for a long time. Altogether there are six houses in work, including ours. And this is the house today. The roof tiles are still there and won't be installed until all the snow melts, which may be a while as we have more snow in the forecast for Tuesday. We are hoping for a completing date of March or April at the latest, and will stay in our apartment until April 19, when our lease ends. This will give us time to get all the closets installed, and have all of our furniture moved in and put away. That's the theory, anyway. 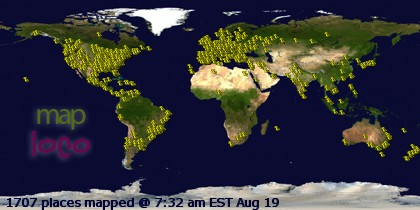 Sunday morning update: I'm so sorry that I haven't been very complete in the posts. We are located in Loveland, Colorado, to be near our grandchildren. While I have been here since late February for the grandson's birth in March, we sold our house in California and my husband (and cat) moved in late July. Almost all of my sewing stash and tools are in storage, which makes for an interesting sewing experience here in Colorado. Last week Classic Sewing Magazine delivered its first issue, and it's a beaut! I was a bit skeptical when I signed up as a charter subscriber, having seen so many magazines folding over the last several years. Creative Needle, Sew Beautiful, and Australian Smocking and Embroidery all bit the dust recon the past several years. Of all the three now defunct magazines I believe that, at first glance, Classic Sewing Magazine, hereafter known as CS, most closely resembles Creative Needle. There are tips for sewing, new products to make your sewing life easier, and general news about heirloom sewing. What I really like is the cover project. It's a beautiful Swiss voile dress with lots of lace designed by Gail Doane, and has the pattern included with the magazine. (Something CN and SB rarely did, but AS&E always). There is a lovely hand embroidered baby bib by Claudia Newton, a very talented designer and teacher, who isn't known nearly well enough. There are also machine embroidery projects with free downloads online. In fact, if you are a charter subscriber, you can download an alphabet designed by Alison Banks for free, something I haven't done yet. Many of the projects are variations on existing patterns, something that CN and SB did all too often. I much prefer having the pattern included with the magazine, as AS&E did from very early on. The christening gown by Connie Palmer is a stunner, but is regally long, and probably very unwieldy. Does anyone really use a gown like this? But I would love to sew it, it is so very lovely. 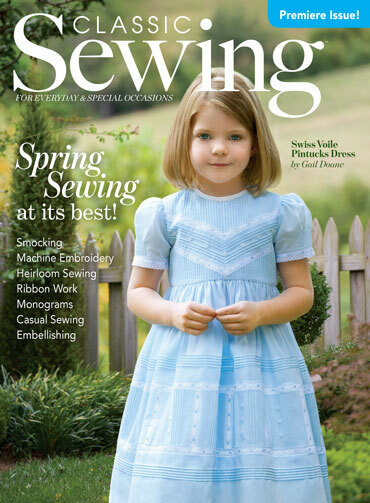 The magazine also contains at least four smocking projects, all suited for spring events. Janet Gilbert's pink dress is especially beautiful, with the three tiered "rumba skirt" ruffle attached to the back. Also included are small projects that can be made by hand or machine, such as Bible (or other book) covers, a bib, bonnets and a couple of projects for little boys, several of which have free downloads available. of patterns for some of the projects is very welcome! The magazine is printed on high quality, heavy paper, with plenty of illustrations of both the projects and the techniques used. Dislikes: There are some inconsistencies in the articles/projects. For instance, on the Williamsburg dress, it is stated that it is fit for a Queen but it is really a fairly simple dress from the era, lovely but not regal at all. While the beautiful christening gown has a monogram on the gown, the article suggests that you can put the baby's monogram on the slip. I would think that on the gown a religious symbol would be more appropriate and the monograms kept to the slip, to make the ensemble usable by many babies. Maybe I'm nit picking this point a bit, but I think it should be obvious. Also, where are the kits? There are no kits offered for any of the projects! I would love a kit of the cover dress, as well as the boy projects for my grandson. This magazine seems to be geared towards the US market, but having a few fall projects might increase its audience to the Southern Hemisphere. AS&E always had projects for both hemispheres in each issue. I would like to see more emphasis on hand embroidery vs. machine embroidery, but since there are four smocking projects I can't complain too much. I am so glad that this magazine is here at last, and all in all, it is a very, very good beginning, filling a void left when the others folded. 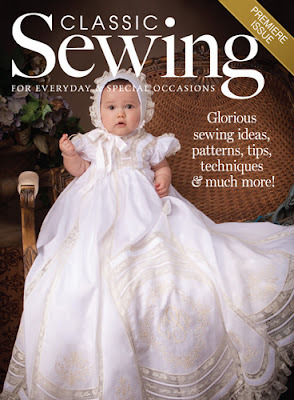 If you would like your very own issue, visit Classicsewingmagazine.com and order a subscription now.